Manisha Merchant has never stopped learning. It’s an apparent truth that applies to both her professional and personal experiences. She consistently utilizes the knowledge and mentorship passed down to her, and she relishes in the personal relationships that have made an impact on her life. It’s a meaningful notion that Merchant takes to heart. “No matter how successful you are professionally, always remember where you come from and those who helped get you where you are today,” Merchant says. Now in her role as executive vice president and division general counsel of Banc of California, Merchant uses her commitment to continual learning to help fuel not only her own success but also the success of Banc of California, which is in an industry that is consistently redefining itself as stricter compliance and regulations arise. Both her level of responsibility and base of knowledge have expanded since she joined Banc of California. Initially, her focus was solely on operations, which included account deposits and banking regulations. Today, though, her role has expanded to include managing multimillion-dollar litigations and internal investigations as a human resource attorney. “You have to learn as you go, so it is great to have friends, colleagues, and resources that help,” Merchant says. It’s this concept of teamwork that also continues to fuel her inspiration. In fact, Merchant will be the first to recognize the successes of her team rather than her personal accomplishments. Colleagues, friends, and resources are all a necessity for Merchant at the rapidly growing Banc of California. With more than $10 billion in assets and nearly forty banking and lending locations, the bank prides itself on a strong balance sheet, deep community roots, and a commitment to lasting and meaningful relationships. With her responsibility for general banking operations, institutional banking, employment law, regulatory compliance, and litigation, Merchant works as a part of a team of senior attorneys. They cover everything from lending matters and merger and acquisition deals to vendor contracts and reviewing policies and procedures. Prior to joining Banc of California, Merchant was vice president and senior counsel at Union Bank for five years. She provided support to the retail banking network, including retail product development and consumer deposit operations. Merchant also worked with business units to ensure compliance with new and existing regulations. One of Merchant’s most impactful achievements at Banc of California has been leading the process of streamlining the use of outside counsel by different business divisions. This has allowed Banc of California to also have a better understanding of its legal needs while giving its in-house attorneys an opportunity to increase their knowledge on relevant issues and ongoing situations. As part of the process of streamlining use of outside counsel, Merchant also led a project to create a preferred vendor list. In doing so, she has removed unnecessary counsel, which were duplicating the services already provided by Banc of California. She also renegotiated rates for the legal vendors that made the preferred vendor list. Identifying the proper resources, in fact, is the key to Merchant’s risk-assessment and risk-management strategies. Her internal communication and relationship with Banc of California’s chief compliance officer also allows her to focus on the most relevant issues, while at the same time ensuring that integration is occurring on every level—from the C-suite to employees on-site at banking locations. There are also a variety of reasons why a more efficient legal and risk management process benefits Banc of California. Perhaps even more important than a successful career for Manisha Merchant is the ability to make an impact on her community. “In college, I would help prepare high school students for the ACTs and SATs, and ever since then, I have had a passion for educating and helping others,” Merchant says. Education is the key at Pratham USA, a charity that Merchant works with to help provide education to children in Mumbai, India. Pratham USA focuses on innovative interventions to address gaps in the education system. But her commitment to education stems back further than her involvement with Pratham USA. 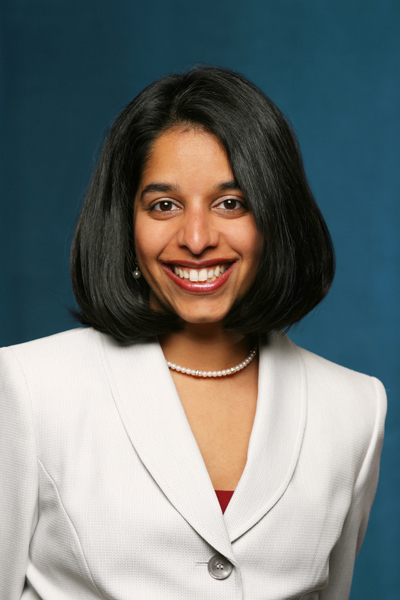 When Merchant first graduated law school, the leaders of the South Asian Bar Association, and later the Association of Corporate Counsel, served as mentors for her when it came to providing advice and professional development opportunities. “They taught me how to be a professional and think out-of-the-box when it comes to ongoing learning and getting the most out of peer relationships,” she says. In fact, Merchant was first introduced to Asian Americans Advancing Justice (AAAJ) through the South Asian Bar Association. “When I first joined Union Bank, Union Bank already had an existing relationship and had sponsored AAAJ in the past. To me, joining the board of AAAJ when I joined Union Bank seemed to be a natural fit in terms of solidifying that ongoing relationship,” Merchant says. She then brought that relationship to Banc of California.